Walking through campus last week I saw a stonemason carving small chamfers every 30cm or so around the edge of plinth being prepared to receive a new sculpture. A few days later there were metal tabs fitted in the chamfers, presumably to discourage skateboarders from using the plinth for acrobatics. These metal tabs are becoming as common in our public places as the skateboarders they are designed to discourage. I can understand old people being worried by fast moving youngsters on skateboards, but the speed and freedom of movement is part of the attraction for young people. 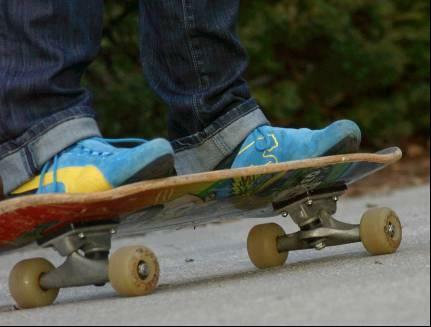 As a teacher of engineering, I see the skateboard as another everyday example of engineering with which to liven up the classroom and grab students’ attention. Try riding a board into class to engage attention! Below is a ‘5E’ lesson plan for beam bending theory based around a skateboard. For more on Everyday Examples in Engineering ‘Bridging Cultures’ on June 12th, 2013; and ‘Disease of a Modern Age’ on June 26th, 2013. This entry was posted in energy science, everyday engineering examples, mechanics and tagged Engineering, mechanics, strain on September 18, 2013 by Eann Patterson. I like especially those 5E lesson plans! Its like you read my mind! You appear to know so much about this, like you wrote the book in it or something. I think that you could do with some pics to drive the message home a bit, but instead of that, this is fantastic blog. An excellent read. I’ll certainly be back.